Genus: Capparis Tourn. ex L.
This species is accepted, and its native range is Tropical & S. Africa. Scrambling shrub, up to 3–4 m. tall, sometimes with branches to 10 m. long. Twigs densely appressed-pubescent, at least when young. Leaves petiolate; blade generally narrowly lanceolate or elliptic, sometimes broadly so, 0.7–6 cm. long, 0.4–3.2 cm. wide, rounded, emarginate, sometimes mucronulate, cuneate, rounded or subcordate at the base, rather thick, appressed-pubescent or rarely subglabrous; petiole 3–7 mm. long. Flowers in few–many-flowered axillary fascicles; pedicels 5–30 mm. long. Sepals 3–5 mm. long, pubescent. Petals 4–7 mm. long, glabrous or pubescent. Stamens 5–21; filaments 2–10 mm. long. Gynophore about as long as the stamens; ovary ovoid, attenuate above. Fruits subglobose or irregular in shape when dried, up to 2 cm. in diameter, orange or red, 1–several-seeded. Thorny, scrambling shrub up to 4 m. tall, often climbing over other shrubs and trees; branches rather zigzag, fulvous-pubescent at least when young; bark green or greenish-black; spines sometimes absent on the young branches. Leaf-lamina 2.2–6.0 x 0.7–2.2 cm., coriaceous, narrowly oblong to elliptic-oblong, rounded or subacute and often emarginate at the apex, broadly cuneate or rounded at the base, sparsely pubescent especially near the midrib or glabrescent; petiole up to 6 mm. long, pubescent or glabrescent. Flowers in aphyllous racemes borne terminally on side branches or in the upper leaf-axils, or the lower flowers in the axils of reduced leaves; pedicels up to 8 mm. long, densely fulvous-pubescent. Sepals 4–6 mm. long, broadly elliptic to rotund, concave, rounded at the apex, densely fulvous-pilose outside. Petals whitish, 5–8 x 2–3.5 mm., obovate-oblong to elliptic, rounded at the apex, villous outside and towards the base inside. Stamens c. 8 on filaments up to 1.0 cm. long. Gynophore c. 1 cm. long. Ovary ovoid, narrowing into a short conical style; stigma minutely capitate, not wider than the style. Capparis rudatisii Gilg & Gilg-Ben. Capparis calvescens Gilg & Gilg-Ben. Capparis flanaganii Gilg & Gilg-Ben. Capparis jodotricha Gilg & Gilg-Ben. Capparis marlothii Gilg & Gilg-Ben. Thiombiano, A., Schmidt, M., Dressler, S., Ouédraogo, A., Hahn, K. & Zizka, G. (2012). 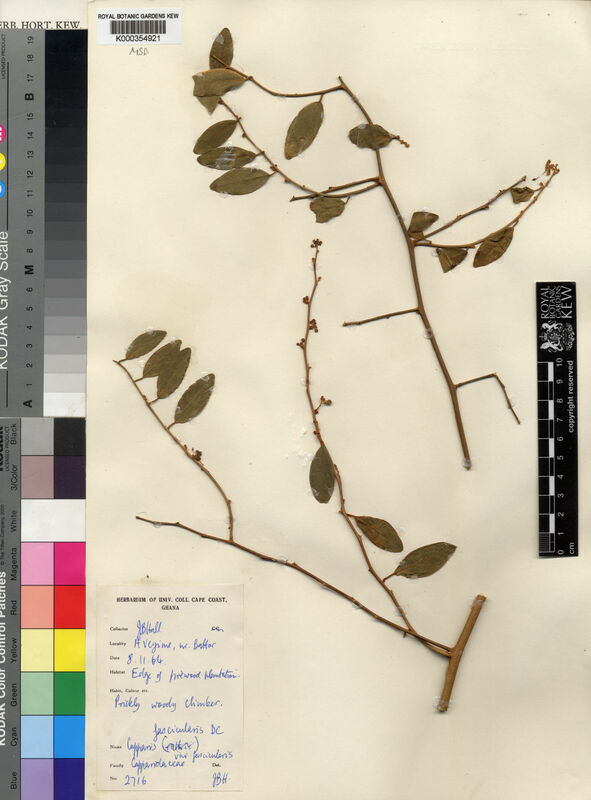 Catalogue des plantes vasculaires du Burkina Faso Boissiera 65: 1-391. Edwards, S., Tadesse, M., Demissew, S. & Hedberg, I. (eds.) (2000). Flora of Ethiopia and Eritrea 2(1): 1-532. The National Herbarium, Addis Ababa University, Ethiopia & The Department of Systematic Botany, Upps. Berhaut, J. (1974). Flore illustrée du Sénégal 2: 1-695. Gouvernement du Sénégal, Ministère du développement rural direction des eaux et forêta, Dakar. Dale & Greenway, Kenya Trees and Shrubs p. 119 (1961). DC., Prodr. 1: 248 (1824).